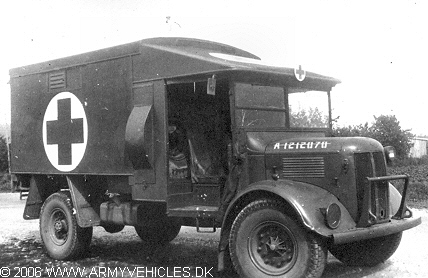 Danish Army Specific: Another example of a vehicles bought from the British Forces in Germany just after WW II. At least 14 were acquired and of those 7 were used by the Danish Brigade in Germany shortly after WW II. Of these 4 were disposed of in the mid 1950´s and probably superseded by VW Transporter ambulances. The faith of the remainder is unknown. Historical: The Austin K2/Y was introduced in 1939, and remained in production until 1945. The chassis was derived from the Austin Motor Company's K30, a 30 cwt open-cabbed military truck. The K2/Y was the most common British Heavy Ambulance in WW II, known as the "Katie", used by all services. The body was of simple construction, a wood frame covered with painted leather-cloth, insulated and accommodating four stretchers or eight sitting patients. It was known as the No. 2 Mk I/L, developed by the Royal Army Medical Corps and produced by Norwich-based coach-builders Mann Egerton. It accommodated an attendant and four stretchers or ten sitting casualties. Fresh-air vents were mounted in the sides, roof an doors. A Clayton Dewandre hot water heater was installed for the comfort of patients. The truck/body combination was occasionally used as van for other roles, and fitted to other vehicles like the Bedford ML and Morris-Commercial CS and CD respectively. More than 13.000 produced at Austin's Longbridge works where production was almost continuous from 1940 until the war ended. Length: 5.49 m (216 inches). Height: 2.79 m (110 inches). Engine: Own 6-cylinder, 3.462 cm3 (211 cubic inches) displacement. Horsepower: 60 at 3.000 rpm. Additional: Top speed was 88 km/h (55 mph).